It was an emotional day for the young Danish talent Casper Steinfath (Naish), having already secured an impressive 3rd place in the fiercely competitive long distance race on Day 1 of the Victoria Cup and in the knowledge that he is undoubtedly one of the fastest sprinters in the world coming into the final day. However, the difference with the Viking this year is the focus and intensity in his approach to racing, something that enabled him to secure the win in today’s sprints in one of the most competitive eliminations yet and in doing so, the overall Victoria Cup event Title here at Stop #1 of the 2016 Stand Up World Series. From the quarterfinals on, every heat was so intense, as Casper was able to consistently lead his heats and secure his spot in the final. In the last heat of the day, Casper had a strong start and was battling for the lead with Mo Freitas (Focus SUP) and Kai Lenny (Naish) throughout, but stepped up a gear on the final leg, as he was able to stave off an impressive final push from Kai and break away from Mo to take the well deserved win. The win, combined with his 3rd place yesterday was enough to secure the Great Dane his first ever win on the World Championship Series after several years of being a regular in the Top 5 and will now give him the confidence and the prestigious yellow jersey coming into stop #2 in Germany next month (June 24th – 26th). 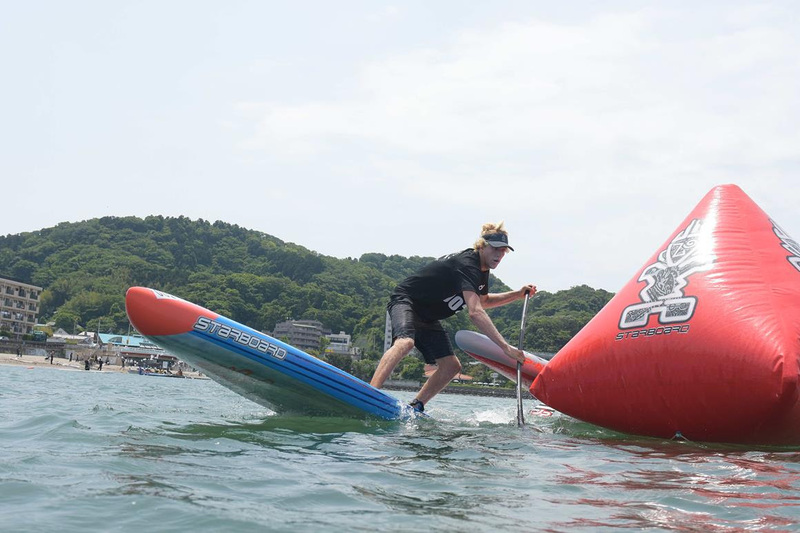 Make sure to stay tuned for the highlights, galleries and complete results at watermanleague.com and on facebook as we wrap an incredible weekend of World Series Racing here at Stop #1 in Japan. 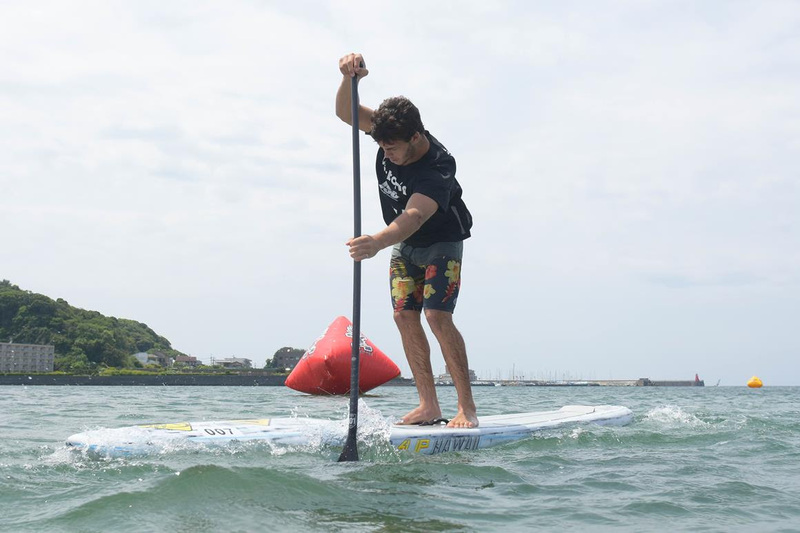 Kai Lenny (Naish) is always excited to return to Japan, having some great memories here in the land of the Rising Sun, and more specifically coming back to Zushi Beach as the defending World & Victoria Cup Japan Champion. In yesterday’s long distance race, Kai lead the lengthy train that took the Super Lap on the last lap, just finishing behind the 3 man pack that took the podium to finish 4th. However, coming into the final day, there is no doubt that Kai is one of the fastest sprinters in the world, and he was looking for redemption and a shot at defending his event Title and holding onto the coveted yellow jersey after Japan. His plan looked on track at the start of the final heat, as he ensured his positioning in the Top 3 after the dramatic and action packed start, battling with friend and team mate Casper Steinfath (Naish) and Mo Freitas (Focus SUP) for pole position. Coming around the last buoy, Casper had the edge and had broken away, but Kai got down low and surged back, pushing Casper until the final yards, with Casper just able to hold off the challenge to take the win, forcing Kai to settle for second. 2nd place in the sprints meant that he tied for points with Connor Baxter (Starboard), but with a win in the long distance, Connor was able to secure 2nd, with Kai finishing in 3rd place. While Kai is always focused on the win, a podium finish at stop#1 is still a solid start to the season, as he will now focus on the remainder of the year with the goal of defending his World Championship Title. Mo Freitas (Focus SUP) is one of Hawaii’s most dangerous double threats, as one of the World’s leading SUP Surfers and Racers, making his presence felt the world over, regardless of the craft. WIth a victory at the inaugural Japan event back in 2014, Mo fell in love with the country and put on another solid performance in 2015 to finish in 7th place overall. In 2016, Mo is coming into his own, and despite a slower performance than he had hoped for in the long distance race on Day 1, he came out of the gates all engines firing for the WOrld Series Sprints, pacing himself through the rounds, but doing enough to secure his place in the prestigious Finals. After an incredibly fast start, Mo took the lead and led through much of the race, only to be overtaken by eventual winner Casper Steinfath (Naish) and Kai Lenny (Naish) on the final stretch to the finish line. However, he had done enough to secure an extremely respectable 3rd place in the sprints, bolstering his overall finish to 6th place that is a solid start to the year. After an impressive finish on Day 1, 2014 World Champion Connor Baxter (Starboard) looked quietly focused today as he set his targets on the final and a strong finish here at Stop #1 of the 2016 Stand Up World Series. Everything was going to plan until the inside buoy of the Finals for the World Series Sprints, where he got a little hung up rounding the buoy, allowing the other finalists to make a little headway on him heading out to the final buoy of the course. Despite a valiant fight back that saw him climb a few spots up to 5th place, he was unable to break into the leading pack to secure a podium finish in the sprints. However, his 5th place finish, combined with his win in the long distance was enough to secure him 2nd place overall at the Victoria Cup Japan, Stop #1 of the 2016 Stand up World Series. Angela Jackson came into the second day of racing here in Japan in 2nd place, and with a clear shot at the event title here at Stop #1 of the 2016 Stand up World Series. Despite the stiff competition, she stepped up to be counted in a major way, as she was able to get the edge over Long distance winner Fiona Wylde and 2015 World Champion Candice Appleby to take the win in the World Series Sprints in dramatic fashion. Given that Angie had a 2nd place in the Long distance, and Fiona, a 2nd place in the sprints, they were technically tied for points, forcing a time calculation to break the tie and determine the overall winner here at the Victoria Cup Japan. 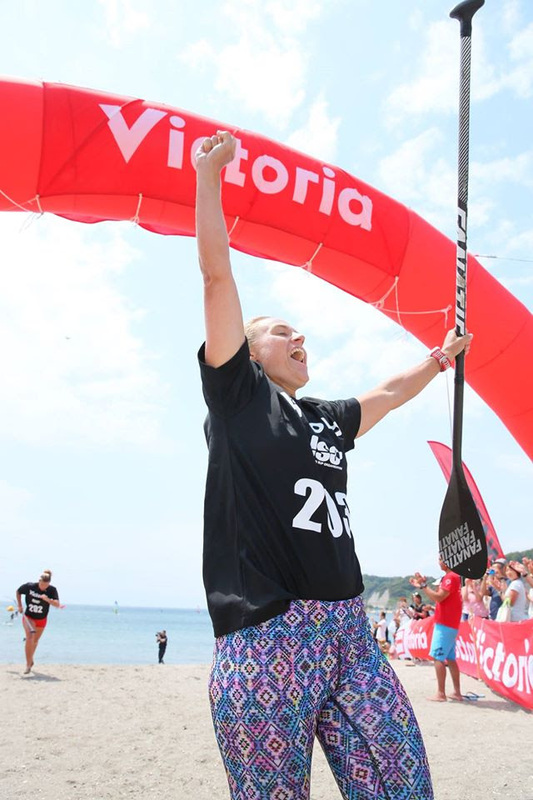 With both Long Distance and Sprint Race finishes being so close between Fiona and Angie, the result went Angie’s way, as the gap between the two’s finishes in the Sprint Racing was greater relatively than the gap between their finish in the long distance, breaking the tie and awarding Angie with the well deserved win here at Stop #1 of the 2016 Stand Up World Series. So a big congratulations to a very worthy Champion here at the Victoria Cup, as Angie will now don the yellow jersey coming into stop #2 that will take place in the new venue of Scharbeutz, Germany from the 24th – 26th June. 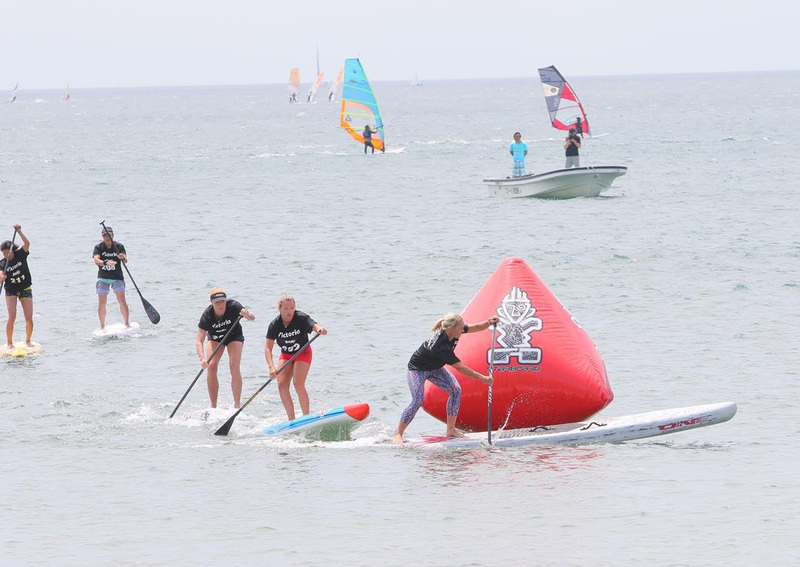 Fiona Wylde (Starboard) continues to impress and make her presence felt as one of the leading women of the sport, with dominant performances in both SUP Surfing and Racing, as she continues to show herself capable of taking down the best of the best. Here in Japan it was no different, as Fiona put on a stunning performance on Day 1 with a win in the long distance, and then pushed right to the sand in her battle with Angie Jackson for the win in the sprint racing, just falling shy of the top spot to finish in 2nd in the sprints. In a nail biting timing calculation to break the tie, it went in Angie’s favor, forcing Fiona to have to settle for 2nd place overall for the event. However, 2nd is an impressive finish by this young talent, and with the new World Rankings Calculations in 2016 that count Long distance and sprint races as independent results (i.e. your best long distance results will combine with your best sprint results to determine the overall rather than individual event wins that combine the both) she is in great shape after stop #1 of the 2016 Stand Up World Series. We now look forward to see how it all unfolds as we look ahead to stop #2 that will take place in Scharbeutz, Germany from the 24th – 26th June in Scharbeutz, Germany. Candice Appleby (Infinity) was looking for redemption today and in the Final heat of the World Series Sprints came out of the gates all guns blazing and looking dangerous. Unfortunately coming around the outside buoy with Angie Jackson and Fiona Wylde (Starboard) right on her tail, she got bumped causing her to drop to her knees, and allowing the the two challengers the chance to slip by her. Despite a powerful comeback, she wasn’t able to make the ground back and had to settle for 3rd place in the sprints, leaving her in 3rd place overall for the event. 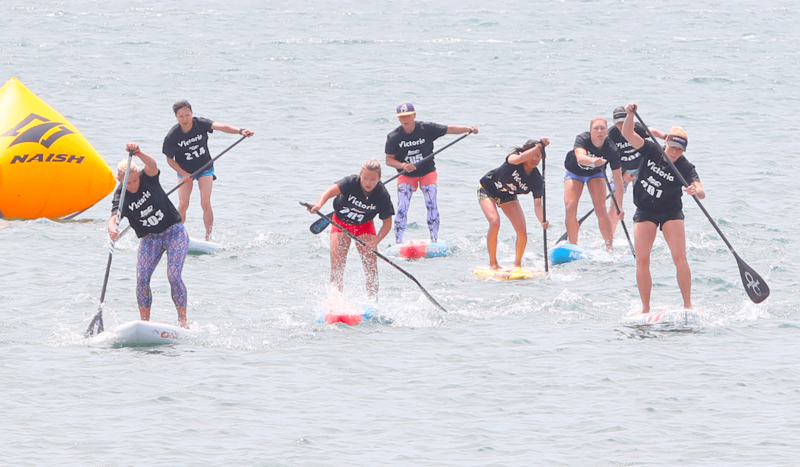 While there is no doubt that Candice had her sights set on the top spot, a podium finish is still a worthy start to the year as she will now look for redemption at Stop #2 of the 2016 Stand Up World Series coming up next month in Scharbeutz, Germany, the Mercedes World Cup of Stand Up Paddling taking place from the 24th – 26th June. 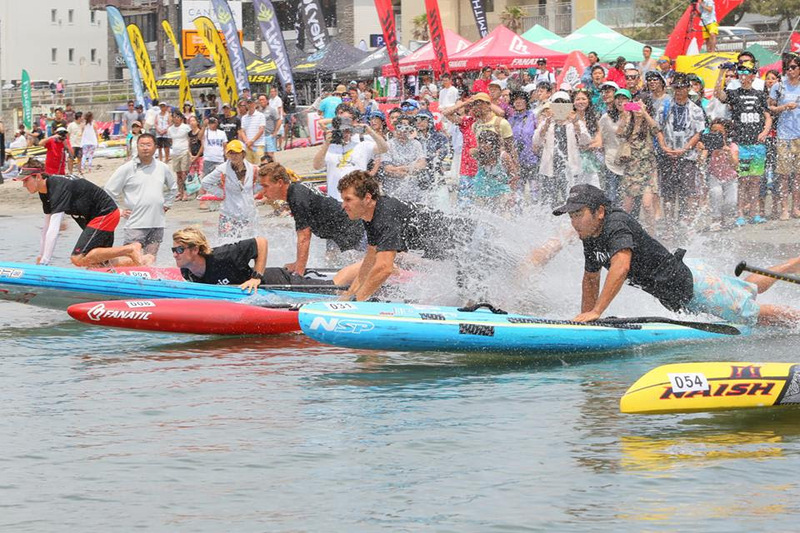 It has been a phenomenal weekend of racing so far, as Japan has once again opened its arms to the World’s very best Stand Up Paddlers for this prestigious Opening event of the 2016 World Championship Series. However, it is not over yet, as we still have a full day of action to come tomorrow, with the annual Japanese Na Kama Kai Clinic with Founder Duane DeSoto in attendance from Hawaii to lead a solid group of volunteers (both Pro athletes and local enthusiasts) for a morning of water fun and education with the 60+ strong group of kids signed up. 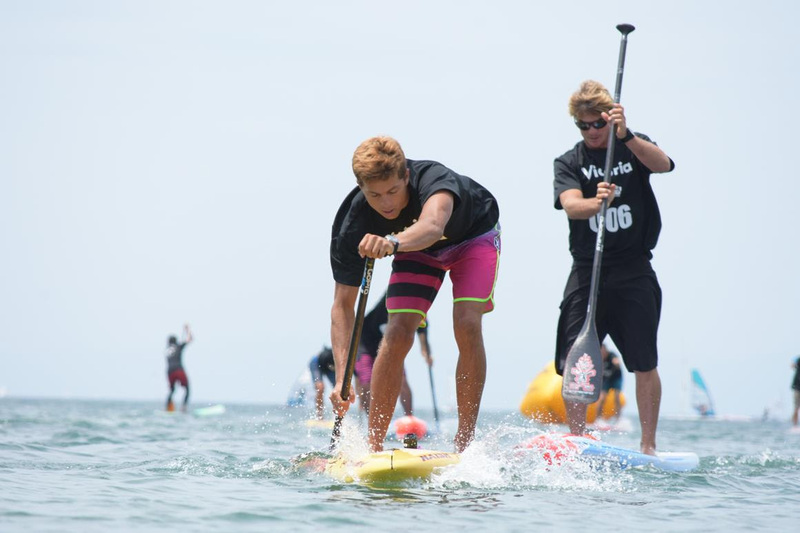 We then have Amateur 6km, 3km and 1,5km races escorted by some of the World’s best, as the Stand Up Paddle community here in Japan are gathering for a full day of fun on the water here at Zushi Beach. It has once again been an incredible experience at the Victoria Cup here in Japan and it has proved to be an ideal Opening event for the 2016 Stand Up World Series. The Racing has been as competitive as it gets, the weather magnificent and the backdrop unparalleled, with Mount Fuji illustrating sheer beauty in all its glory. A big congratulations to all our athletes, both international and local and a big thank you to the Victoria corporation and all our industry partners, not to mention our World Class support crew on the ground here in Japan making the event everything it should be.